Have some fun getting ready for Mother’s Day. 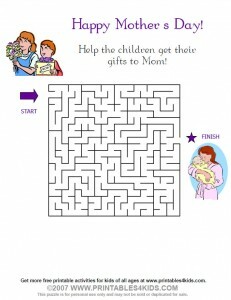 Print out this Mother’s Day maze then have the kids solve the maze to get their gifts to Mom on Mother’s Day! Click on the image above to view or print the maze full size or download Mother’s Day Maze as a PDF file. Check out the rest of our Mother’s Day printables, too! Cute! Thanks for the link, as always.